Widowed at a young age and left with the care of her daughter and nephew, Susannah Baylor has grown accustomed to fending for herself on her Texas farm. When a local buyer attempts to cheat her out of a good price for her cotton, Susannah finds herself in unfamiliar–and unwanted–territory. She must hitch her mules and take her cotton to port, and she must solicit the help of a shiftless bachelor named Henry to get there. 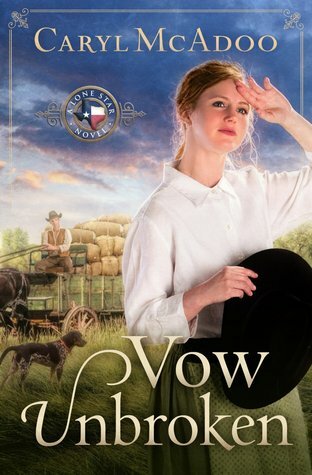 In Caryl McAdoo’s Vow Unbroken, readers are taken on an adventurous journey through historic Texas, where danger and trouble lurk along the trail, and personality clashes create enough spark to ignite attraction. McAdoo’s characterization is excellent in this debut novel. Susannah’s headstrong sassiness and Henry’s wise patience make for great romantic tension and enhance the situations of conflict throughout the story. The children Levi and Becky, and Henry’s faithful dog Blue, work together to make this traveling band loveable and interesting. Susannah’s character is realistic. She has both flaws and positive traits. Her love for the children and her drive to accomplish her goal make her an admirable character that many women can relate to. As a young woman who widowed shortly after marrying, however, she has little experience with people who are not like her. She’s quick to resist advice, and carries some biases inherited from childhood. But her experiences along the journey, and her desire to please God, help Susannah learn and grow throughout the story. What she cannot change, however, is the vow she made to herself and to God to never marry again without her father’s consent. And of all the trials she faces on the trail, her vow–and keeping it unbroken–become the greatest. McAdoo’s debut novel was a joy to read, and I gave it five out of five stars. I’m not sure, Daniellajoe, but life gets so busy even I’m starting to consider audiobooks (did I really say that?!?) :-). It’s definitely a heart-warming read!